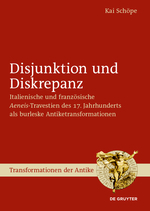 Kai Schöpe, Disjunktion und Diskrepanz: italienische und französische Aeneis-Travestien des 17. Jahrhunderts als burleske Antiketransformationen, Berlin-Boston, 2016. This study deals with Italian and French travesties of the Aeneis published in the 17th century. These works imitate Virgil's authoritative work through contrast. Travesty as a special kind of disjunctive transformation of antiquity thereby reveals the conflict between provocative transgression and the persistence of traditional poetics in the Early Modern Age.